I'm a pretty big silent film buff. I travel from the East Coast to San Francisco each year to attend the SF Silent Film Festival and I have managed to amass a pretty good collection of silent films on DVD which I frequently enjoy. 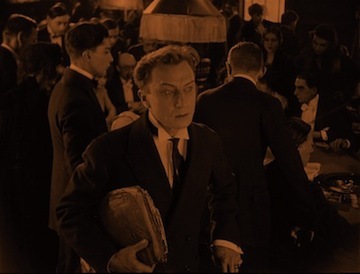 Previous to Flicker Alley's release of The Late Mathias Pascal (1926), I hadn't encountered French director Marcel L'Herbier or the star of the film, Russian actor Ivan Mosjoukine, so I wasn't sure what to expect. As it turns out, I was missing something special. This film is a wonderful experience. Part drama and part comedy, the film can be appreciated as a straight story or as an comment of the human condition and the hazards of getting what you wish for (if you feel like getting philosophical). This release should put both Mosjoukine and L'Herbier on the radar of early cinema fans and hopefully more of their work will become available. Mathias Pascal (Ivan Mosjoukine) is the oldest son in a well-to-do family. Expected to take over the family lands, and all the responsibility that entails, he's a dreamer who yearns for freedom. He's working on a book, The History of Liberty, when his father unexpectedly dies and the family falls on hard times. His mother is forced to sell the ancestral estate and gets swindled in the deal. As this is happening, Mathias' best friend, Pomino, has fallen in love with the town beauty, Romilde. He's too shy to actually speak with her however, so he convinces Mathias to approach her on his behalf and declare his love. During the harvest celebration Mathias manages to get Romilde away from the crowds and, a bit awkwardly, tells her that he has a friend who has admired her from afar. The young lady thinks that Mathias is talking about himself, and since she's had a crush on him for a long time she's thrilled. She confesses her love to the object of her affection, Mathias is taken by surprise but excited, and the next thing you know they're married. Domestic life doesn't quite suit Mathias who only wants to be free. While he loves his wife, his mother-in-law is a harsh shrew who lives with them and poisons her daughter against Mathias. He doesn't have any skills to speak of, but finally lands a job at the library, a disorganized and dusty place. It doesn't pay much, but he's able to support his wife, her mother, and the baby girl that comes along. Mathias loves his daughter dearly. She's the only person he really loves aside from his mother, so it's no surprise that's he devastated when a disease sweeps through the town and takes both his aged mother and his baby girl. It's too much for him to take, so he gets on a train and runs away to Monte Carlo. Still devastated by the loss in his life, Mathias walks through the streets as if in a dream and ends up in a casino where, against all odds, he wins a fortune. With money no longer a worry, he travels back home to share the good news with his wife, but on the way back he spies an article in a newspaper stating that the decomposed body of Mathias Pascal in a river. It's assumed that he committed suicide over the grief of his loss and his money worries. With this news Mathias realizes that he's finally free. He doesn't have to worry about money, he doesn't have to worry about his wife and mother-in-law. He doesn't even have a name anymore. At last he has total liberty! So he travels to Rome where he takes a room at a boarding house and falls in love again, and slowly comes to realize that being totally free has its disadvantages too. 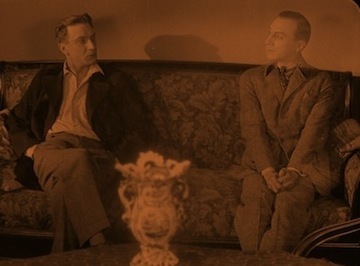 Writer/director Marcel L'Herbier creates a bravura film that works on several levels. Running only a few minutes shy of three-hours long, the director basically looks at Mathias' life twice. Once while he's alive and a second time after he has 'died.' It's interesting to see how the character behaves before and after he's liberated, and how he handles the pitfalls that life throws in his way in both scenarios. By this time in film history directors had discovered how powerful images could be and worked to construct them. L'Herbier goes out of his way to create interesting compositions. There are a couple of reoccurring themes that work well to both tell the story and make it visually engaging. 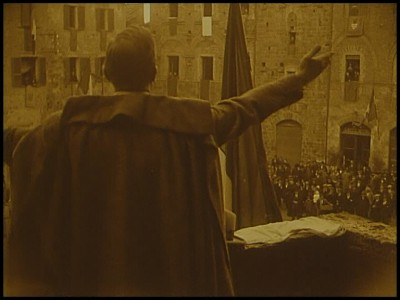 Several times he has an object fill most of the frame in the foreground while the action was taking place in the background. It was different, but worked well in the context. 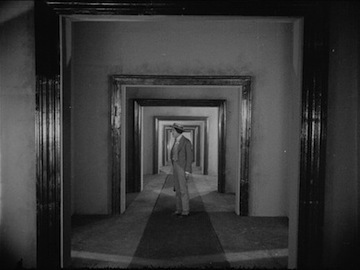 He's also fond of repeating images, such as several doorways, successively smaller, repeating down a long hallway. L'Herbier also comes up with some wonderful and unique ways to solve the problems that he comes across in the course of the film. For example, how do you show the passage of time between Mathias falling in love with Romide and when they're married and living with her mother? That intervening time isn't important to the story, but you have to let viewers know that time has passed and events have occurred that impact the characters. L'Herbier solution is to have Mathias and Romide dance around when they first fall in love, he then superimposes that over a scene of the pair getting married, and dancing. This dance scene is then cross-faded with the pair dancing in their home, no longer wearing fancy wedding garb but the tattered clothes that they a accustomed to. The movie is filled with interesting visual flourishes, a dream sequence and a part where Mathias fights with himself spring to mind, that make it an incredible visual feast. 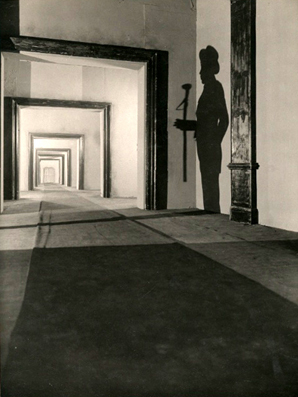 Actor Ivan Mosjoukine also gives a magnificent performance in the title role. He's uses a lot of very subtle facial expressions to reveal what he's thinking and its impressive how much he can do with so little movement. The scene where he realizes that Romilde is in love with him is a great example. The camera focuses on him, and goes from nervousness to surprise to elation with just the smallest changes in his face. There's no over the top scene chewing here. He's also at home in the comic aspects of the character. If anything, he's more at ease in those scenes. The only complaint I have is that the ending, while satisfying, seemed a little too pat given the rest of the film. I wasn't surprised to discover that the book that the movie is based on had a different conclusion. The details of the original ending are included in the booklet that accompanies this disc. The film comes with a full orchestral score written and conducted by Timothy Brock and performed by the Orchestra del Teatro Communale di Bologna and it sounds magnificent. The music enhances the film greatly, accenting the emotion on screen while never being intrusive, and the orchestra playing the piece is magnificent. The quality of the audio track is equally impressive, with a large dynamic range and crisp clean sound. It's a very nice sounding disc. 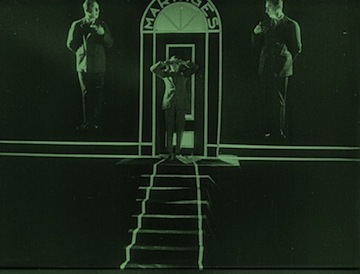 This film was restored in 2009 from various elements, most notably a nitrate print that was given to La Cinematheque Francais in 1958 by director Marcel L'Herbier, and the picture quality is superb. The images have a lot of definition, the contrast is excellent, and the level of detail is better than I was hoping. On top of that the movie is tinted using L'Herbier's print as a guide. There were multiple prints used to create this three-hour long story, and some were weaker than others. Some short sections look like they come from 16mm dups and there is some nitrate decomposition in a couple of places, but these are all minor problems. They did a fantastic job overall and the film looks wonderful. The only extra is a very informative booklet included with the dies. This has an essay by film historian Richard Abel. With an engaging story, a wonderful cast and a visually interesting design, The Late Mathias Pascal is a treasure. Yes, it's a long film, but it is well worth watching. Silent film fans should make a point of searching this one out. Highly Recommended.